NASA is set to announce the landing site for its next Mars rover Friday (July 22), and one thing's for certain: It will be a crater. Earlier this month, the space agency revealed that its $2.5 billion Mars Science Laboratory mission will drop the car-size Curiosity rover down at either Gale Crater or Eberswalde Crater. Both Martian sites appear to preserve a record of ancient water activity. That's crucial, because Curiosity's main task is to assess whether Mars is, or ever was, capable of supporting microbial life. So which crater has NASA picked? The space agency hasn't tipped its hand, saying publicly that both craters have a lot to offer and that choosing between them is tough. Gale Crater, which is near the Martian equator, offers access to a wide range of rock strata, including sulfates and phyllosilicates in a mountain three miles (5 kilometers) high. Curiosity could probably drive partway up this mountain, checking out layers deposited during wet periods with changing environmental conditions. While both Gale and Eberswalde are craters, they are very different sites. For starters, Gale sits close to the Martian equator, while Eberswalde is located considerably farther south. And Gale is much bigger — 90 miles (150 kilometers) wide, compared with 40 miles (65 km) across for Eberswalde. Scientists think Eberswalde is an ancient delta, a site where a river once flowed into a lake. Eberswalde abounds with phyllosilicates, clay-like minerals that preserve a record of long-term contact with water. So the area would likely be a happy hunting ground for Curiosity. But Gale has its own selling points. The crater also has phyllosilicates, as well as a veritable mountain of rock layers the rover could analyze. A huge mound 3 miles (5 km) high rises from Gale's center. If Gale is the choice, Curiosity would chug partway up that mountain, checking out layers deposited during changing environmental conditions, rover scientists have said. Indeed, Gale's giant, tantalizing sediment mound may mark the crater as the frontrunner. Last month, the journal Nature announced that scientists were pushing hard for Gale, though no final decision had been made. At this site in Mars' southern hemisphere, an ancient river once flowed into a lake. The area abounds with phyllosilicates, clay-like minerals that preserve a record of long-term contact with water. Here on Earth, oil geologists have built up a store of knowledge about how to look for organic materials in river deltas. Mission scientists and Curiosity may be able to tap into that knowledge in operations at Eberswalde. 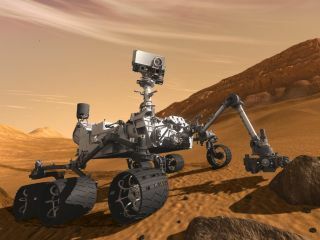 The Curiosity rover is slated to launch from Cape Canaveral, Florida, toward the end of November and arrive at the Red Planet in August 2012. Curiosity is much bigger than any previous Mars rover; it's the size of a Mini Cooper and weighs about a ton. That's too large to make a landing cushioned inside airbags, the way the twin rovers Spirit and Opportunity did back in 2004. Instead, NASA engineers devised a rocket-powered sky crane that will hover over the Red Planet, then lower Curiosity down to the surface with cables. This system is entirely novel, but the MSL team has faith it will work. "We have a lot of confidence in the sky crane," Grotzinger said. Whether the choice is Gale or Eberswalde, Curiosity will chug around the Red Planet slowly but surely, studying its environs with a suite of 10 different science instruments. The rover's mission is slated to last about two Earth years, but it wouldn't be a shock if Curiosity lasted longer than that. The golf-cart-size Opportunity, after all, is still going strong more than seven years after it hit the red Martian dirt.